With either of them failing to find their rhythm, Chelsea’s Carabao Cup semi-final first leg clash with Arsenal ended goallessly. The match resulted in disappointment to supporters, with both of the top-tier clubs not coming up to scratch to claim an upper hand when going on to the second leg. Additionally, they couldn’t even forge many shots on target, and displayed horrible set pieces in the determination-deficient fixture. However, a particular incident in the first half aroused everyone’s attention. As announced earlier, the Gunners clashed with the Blues at Stamford Bridge with the Video Assistant Refereeing, VAR for short, alive and kicking on the sidelines for any controversial decision. It’s certain that the newly introduced feature pleased most clubs and their respective supporters, with numerous questionable decisions given away in the recent weeks. Whilst the new system wasn’t required for the City vs Bristol fixture, it proved to be useful on one occasion at Stamford Bridge. Moments before the half-time whistle, Chelsea’s Victor Mosses seemed to have clipped the heels of Ainsley Maitland-Niles, while the 20-year-old was running through on goal, in the penalty area. Uncertain, the referee relied on the Video Assistant Refereeing feature. While Martin Atkinson hectically spoke to his assistants on his mic, the away fans did something outlandish. The Gooners chanted repeatedly: “V-A-R, V-A-R, V-A-R”, amusing everybody watching the substantial game. The Arsenal fans were thus mocked by football fanatics, as they took it to social media. 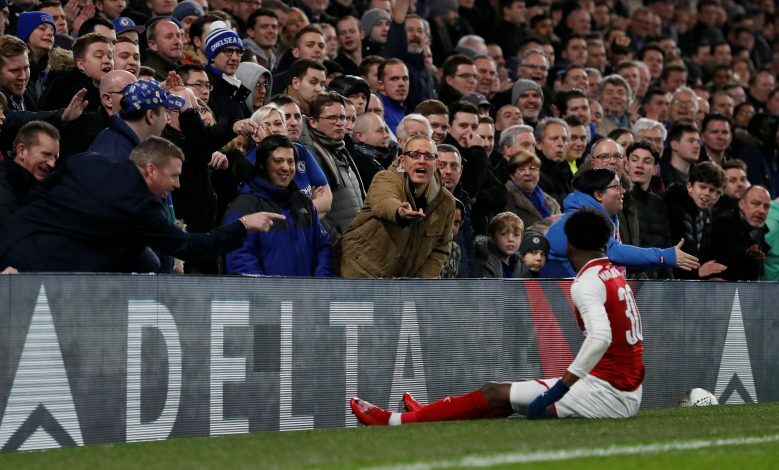 Numerous reactions followed the incident on Twitter, with some picking up on Arsenal fans’ chant, and some mentioning the penalty awarded to Hazard the last time around.